I will never forget how the movie The Wizard of Oz lingered in my heart for days after I first saw it. I was just a child like the heroine Dorothy, who won me over the instant she effortlessly sang the dreamy lines of Somewhere Over the Rainbow. I was moved profoundly by the story of this young girl who had been caught up by a complicated dog matter and a whirling tornado that transported her to a strange and bewildering land far from home. While watching the adventure play out on television, I joined the story in my imagination. I cheered for Dorothy as she came to the defense of her spirited puppy, Toto, when a witchy woman wanted him killed. I sank deep into the couch cushions and trembled with fear when the black and white farmhouse was lifted in a storm, then crashed down in an unfamiliar place of Technicolor. Along the yellow brick road, I made friends when Dorothy made friends. Never again would I look at a scarecrow, a lion, or a tin can the same way! I shared in her longing for a safe return home to her Auntie Em and their farm in Kansas. My heart-hopes soared with hers as Dorothy was told of a powerful man in the Emerald City who could help her: the Wizard of Oz! As with any good story, there were scary struggles and frustrating setbacks. Flying monkeys captured Dorothy and her friends, and a wicked witch set out to destroy her. Even so, determined Dorothy continued on the yellow brick road toward the Emerald City because she’d placed her hopes in the powers possessed by the famed Wizard of Oz. Sadly, after persevering through all the dangerous predicaments, Dorothy and her friends found out that the wizard was, in fact, powerless. Powerless! What a stinkin’ disappointment! Dorothy was crushed. Her buddies were crushed. I was crushed. How in the world could this happen? Hope had skipped alongside them for the entire journey down the yellow brick road. How could anticipated strength possibly fade to weakness? Hearts were heavy with the ache of disappointment. All seemed lost. Then a surprising shimmer of hope broke through: Dorothy actually possessed the power that she needed to get home. In fact, she’d had the power all along. Her ruby red slippers were the key! Let me just say, at this point happy dances were thrown down on both the screen and in my living room. Tears fell as goodbyes and hugs were shared. Then Dorothy grabbed Toto and made her way home by calling on the power that had been with her all along. Within seconds, the Kansas girl found herself back over the rainbow of a dream, safe and sound at home. I can relate to Dorothy on so many levels. She was a girl with a dream and a song in her heart. An average, ordinary girl who had to deal with complicated people and sort through difficult circumstances. A girl who knew how it felt to place her hope in other people and be disappointed. A girl who finally came upon the strength she needed to find her way home. Moses, too, faced complicated challenges and whirling storms of circumstances. Born in a time when he, as a Hebrew baby, was supposed to have been killed, Moses was saved by God’s sovereign grace when Pharaoh’s daughter pulled him from the Nile and kept him as her own. A Hebrew among Egyptians, Moses was raised in a land and culture that was far removed from his heritage and from the One true God of Israel; as far as black and white is from Technicolor. Moses set out to free his people through the power of God. Though the Pharaoh doubted God’s strength, the Lord displayed His might, plague after plague, until finally it looked like Pharaoh got the memo. At last he let God’s people go. Moses’s yellow brick road of rescue led him and the Israelites out of Egypt. But when Pharaoh changed his mind and gathered his army to chase them, the Israelites ran smack dab up against the Red Sea. My goodness. What a story! What. A. God! “Israel saw the great power that the LORD used against the Egyptians, so the people feared the LORD, and they believed in the LORD and in his servant Moses” (Exodus 14:31, ESV). Are you experiencing the strength of God? You might be struggling with this, wondering where God is in your story. Perhaps you find yourself lamenting to the God of Strength, El Sali, wondering why you’ve been forgotten and why you feel weak. Maybe things are good for you right now, but you know of others who have encountered shadows along their yellow brick roads. Each of us is guaranteed life challenges, but God promises to be our strength when we call on Him. He is not a puffed up and powerless wizard of Oz hiding behind a curtain, pulling strings. He is El Sali, the God of Strength who loves you and longs to move in and through your life. Will you trust Him more deeply today and allow His joy to be your strength? You are powerful and loving. Thank you for allowing me—this average, ordinary girl with complicated relationships and difficult circumstances—to have access to Your perfect Strength when I am weak. Help me to trust You when all my heart sees are lions and tigers and bears. 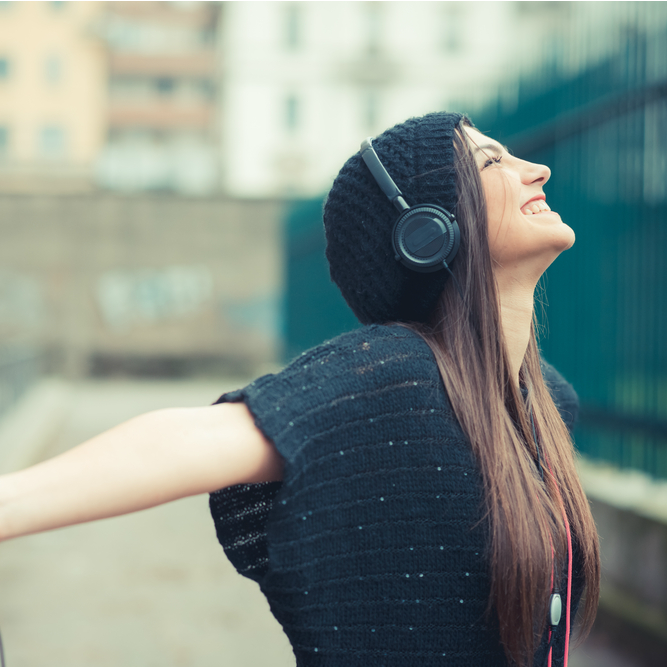 Nehemiah 8:10 says, “…the joy of the Lord is my strength.” What do you think the joy of the Lord looks like? Have you seen it lately? Share your story! Tell me about it in the comments section of my blog. FOR YOUR WORSHIP RESPONSE: Click now to hear a song I’ve posted and take a moment to worship our God who is both our Strength and our Song! Thanks for doing life with me! 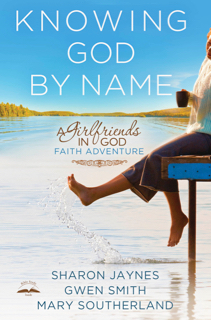 Today’s post is adapted from Knowing God by Name. This is the perfect book for individual study or for gathering a group of friends. 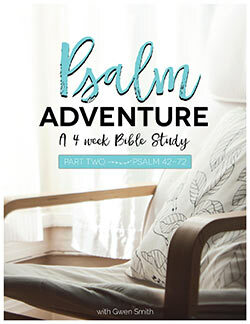 With impactful devotions, study questions, journal pages, and free on-line video intros, this book is a resource you’ll refer to time-and-time again. 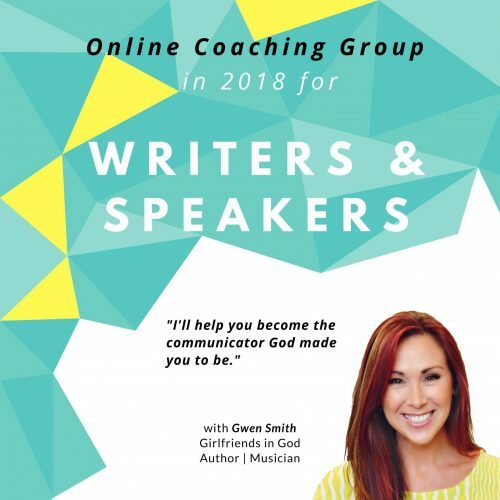 For 6 months, I’m offering an exclusive online professional coaching group to 12 writers or speakers. I usually don’t offer coaching opportunities because my time is limited, but I feel strongly about helping you become who God made you to be. I’m partnering with a network called: ‘Tailored Coach’ where each group is 100% online, with live video coaching calls and collaboration with peers each month, for 6 months. Specifically this coaching group will focus on writers and speakers, helping them communicate, lead, promote, and execute a plan to achieve success. If you find yourself as a busy writer or speaker, that can’t seem to get out of the weekly grind, this is for you. Here’s the link to the coaching page, where 6 sessions are laid out to develop you over 6 months. I hope you apply today before it fills up! Going through a time where fear could rule my day. But the intimate love of God has shown up in very tangible ways through a friend’s comment, a devotional, a sermon, or a conversation with girlfriends. He has found repeated ways to remind me of His character and His existence as the strength of my life. Reminding me that He does not have strength He IS strength. It is who He is. Feeling wrapped and surrounded by a God who fortifies our relationship with love, grace and strength through intimate moments that seep into the darkest spots of my world to expose Him as a “not out there” God but a “right in here” God who listens and provides. Yes, yes, and YES! He IS strength… an ever-present help… and I am so grateful. Love these thoughts and love YOU, Veirdre! Hi Gwen This was for me today and spoke volumes to me as I’m going through storms it’s amazing how God speaks to us through resources and our brothers and sisters in Christ may God bless you richly in your obedience to Him..
Hi Gwen! My 92 year old Mom passed away this last Sunday! This song is perfect! Thank you! Sorry for your loss, Shirley! My grandma is 94 and I cherish her greatly. I know yours will be missed. Thank you Gwen, I needed that reinforcement today. You are an amazing beautiful woman and I where my shirt proudly, Broken into Beautiful and think of you and us as women of God… Praises to you and Blessings on your day. As I read your devotional about Moses and the Israelites seemingly stuck at the Red Sea, I realized I’m facing an obstacle similar to that of being trapped between the Egyptian army and a body of water. In my mind’s eye I saw the parted Red Sea rising up high above me, at first NOT seeing the way through. 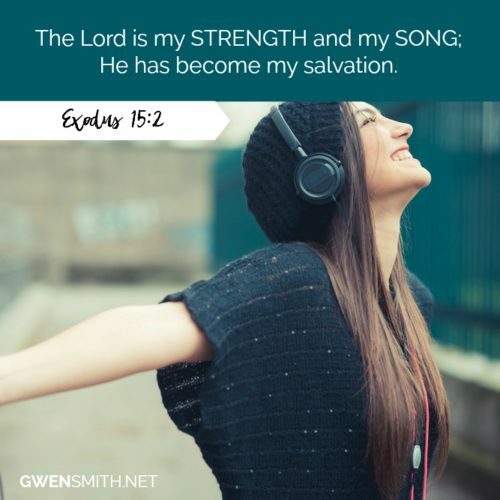 Yet the words of Moses’ song encouraged me that the LORD is my strength and my song; His joy is my strength. So as I look at my husband’s mom and my mom, both nonagenarians with health problems and wonder where is the strength going to come from for my husband and me to help them, now I KNOW. It has and is and will come from the LORD. I can rest in Him, knowing this. Praise be to God who daily gives us all we need and even more than we can imagine! Yes, Anne! So true! Love this. Praying for your family right now. Your song is beautiful, Gwen! Thank you for your God-filled devotions! It cause me to recollect my thoughts and actions. God take away my stress, my pain every day I can see over the rainbow… God is amazing good…. thank you for the beautiful message and the song. Thank you for sharing…a much needed word. The Lord has plans for us but many times we think we know the way, but our ways are not His ways. Easy to get distracted. Love the song! I think we can all follow our yellow brick roads to the streets of gold. grateful…..this year I am focusing on gratefulness, what a start to the new year!! There is no one that can outdo him. Thank you Lord!! This blessed me so much. I came to know HIM as my STRENGTH as I would return to my classroom a few days after a chemo treatment. Nehemiah 8:10 was my verse!!! I am doing a 21 day fast and I am amazed at how God has been with me on the first 11 days. I have many struggles and I am facing a large problem, but I know that God is holding my hand thru this storm, and I am praising him thru this storm. Thank you Gwen for your devotions and for your love of Christ . I had experienced the joy of the Lord many times in my entire life.Some are small & someare overwhelming! I especially want tothank him for transforming me from a woman of great fear, no courage, shy & timid and living maybe with guilt and shame that I did not even realised that they are not what I am suppose to wear because they are not What God intend me to be.I was actually living in darkness that I do not know how to get out of it to see the light of God. Little do I know that there is a loving God who has always shine his light on me and show me his ways, not my ways.I struggled a lot throughtout my life missing his blessings simply because I was blind to his words and did not know him intimately.However, through all the little & big storms I have in my life, God has amazingly shows me his grace, mercy, forgiveness and abundant love which I never knew and in fact many blessings have come out of disguise.I could not thank God enough for the joy I never expect. My most recent joy of God was that I have discovered was that when I experienced a health threat of Fibriobs.My initial feeling was fear and anxiety.I told God to help me as I know that even if I have to go through the worst, I ask him to give me strength, peace, removed my anxiety and fear. It was like going through a death valley that I did not know what to expect next but I know I will be received in my Father’s arms.He has assured me the peace in me no matter what happens that I will trust him and cling on to him tightly like his beloved little daughter.The peace I derived from knowing he is in control has transended into feeling the joy of the Lord in my heart. I did not feel anymore fear and anxiety in knowing that he will see me through the valley of the death.Amen. The LORD Is my strength. Do I believe he can free me from my chains or only some chains? This devotion is an answer to prayer. My heart dreams of being free and I can not do it on my own! Praise God that I don’t have to. Give us this day our daily bread for the flesh is weak. Our mom just died, but reading this blog, I just realized that our family did not blame but thanked God for allowing our mother to rest. We know where she’s gone, and we know that He and she are still with us. Praise the Lord for helping us to trust, and thank Him for allowing us to experience our mom, a great example of God’s love to everyone. I’ve known since I was adopted into God’s family that He is source and joy of my strength. But during the last 2 years, I really struggled with this concept. So many trials concerning family just overwhelmed me and I just couldn’t seem to sense the joy of God’s strength. But then before going to my hometown in MT this summer, God restored my strength in a big way! This trip provided opportunities to be renewed in so many ways. I know now with his restoration that going back home to our remote village will be better. Praise Him!! Thanks to all of you girlfriends in God and for being his vessels to encourage so many fellow girlfriends! God is my strength I know He is. He’s told me he will never leave me. I have so much trouble remembering that and trusting Him for it. I keep trying to get through my days on my own strength, which is very little. I’m having some muscle, joint issues that have been going on for a while. I work as a janitor, plus we are in renovation, building our home. But my strength just does not get better. I had a time where I was calling on God and I know he helped. I need to recommit to prayer and trusting Him for His strength and healing. He is my Strength. My days are full of things I need to do, and my strength is not enough. His is more than enough. I know that the Lord has provided so many times in my past. He has provided in huge extraordinary ways! He has provided both finically and given me awesome friendships! I know the Joy of the Lord is my strength and some days I have to cling even closer to Him, but sometimes I forget and become worried looking at my circumstances instead of how big my God is! I’m in transition right now, I have to move out of my house, find a job and a place to live. I’m not exactly sure what the next step is. I’m a little scared about the Lord carrying me through and providing for my needs because there are so many unknowns. God has given me the strength to get through 4 miscarriages without completely losing mind! His plan, not mine, is what I’m following! 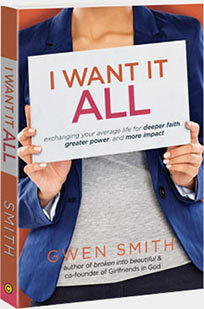 So happy to have found this daily devotional for women! I too was a huge fan of the Wizard of Oz. Back in the day, we only had 2 TV channels and it came on once a year! And yes, I am so very thankful that our God is real and not just someone hiding behind a curtain like the wizard. Oh, and by the way, my name is Guinn Smith also. Just a little different spelling! Thank you for your beautiful words to help get my day going in the right direction! Joy looks like an answered prayer and knowing that if He doesn’t He still has the power to do it. I have always wanted a painting titled joy. Guess its time for me to create it. I enjoy your devotions. Thanks. My three yo nephew had open heart surgery yesterday. It took a major act of faith to let the doctors put his little heart in a bypass machine while we all waited anxiously for the report. Although they were unable to repair two small holes in his heart, we are standing on El Sali, our rock, when everything else in us trembles and quakes. We choose to stand by faith, and not by sight and are praying for a healing miracle from God, The Great Physician. One year ago, I had a seizure that led to a hospital stay where it was determined I had a lesion on my brain. Surgery was required. I have always believed in God and Jesus, but never took the final step to surrender my life to God. The church I attended as a child seemed to focus on the negative aspects – punishment for doing the wrong thing, not grace. I never felt I was able to perform well enough, so I never committed myself. I was fortunate to have friends who are members at a wonderful church who taught me about grace and I gave my life to God on July 17th, 2013 and was baptized July 25, 2013, one day before my surgery. So when the cancer diagnosis came a few days later – a very aggressive form of brain cancer called Glioblastoma Multiforme Grade IV, which is the most aggressive form, I was not afraid, I was not angry, because I knew God had me in the palm of his hand. Because the cancer is so aggressive, the doctors prescribed a very aggressive treatment plan. Radiation and chemo at the same time, with maintenance doses of chemo to follow. It wasn’t always easy, but God gave me the strength to tolerate all the treatments. There has never been a doubt in my mind that it is God carrying me through and that gives me continued resolve to stay on the doctor’s plans. And one year later, there is no evidence of the tumor recurring! Praise my awesome God! Sidenote – I spoke with all my doctors – four of them – to be sure they were people of faith. One I was already sure about and he has prayed with me in the exam room. I was surprised at first – doctors don’t normally do this, then I felt so blessed to know this man of science was guided by the divine! The other three assured me their trust was in God. So I told them – Okay let’s get busy! God is going to heal me with your help. When I got the good news the tumor wasn’t coming back I immediately thanked God, not caring what the doctor thought because I knew he understood. God has a plan for my life and it’s for my good and His glory. I finally figured out to get out of His way and let Him work in my life! Amazing grace how sweet the sound! And I know my journey has had a tremendous impact on those around me because they have told me so. My only regret is that it took me so long to understand the grace, joy and strength the Lord has to give. The joy of the Lord is my strength. With no income coming into my household he is still providing. So I praise and thank him through the storm. El Sali, God of strength gives me that everyday. At times I feel like giving up and giving in. But God! No he want let me. He is my strength. Hallelujah! The JOY of the LORD is my STRENGTH!! I depend on the LORD every day of my life. Without Him and His strength, I would cease to be. At all the bad times in my life, even when I am the cause of the bad place I am in, the LORD has always lifted me up and out of that place and set me back on the path of righteousness. When I was so depressed all I wanted to do was die because no one cared about me and what I was feeling and going through. No one but the LORD! He is always there for me and I love Him for that. He listens to me and He tells me “Do not be afraid! I will help you!” Praise the LORD for he is good and His love endures forever! Amen!! The Joy of The Lord is my strength. Wow just leaning and depending on Him thru it all. good days bad days He’s still God and just knowing He’s there waiting with open arms. “I can’t keep going Lord you’ve got to help me ” and He will be your strength, He will place a smile on your face that will go beyond understanding. Thank you so much for your wonderful devotions! I have been following you for a few months now and have been so very encouraged by your writings. This is my first time to visit your blog, and i’d like to share a story of God’s strengthening me in a time of need. 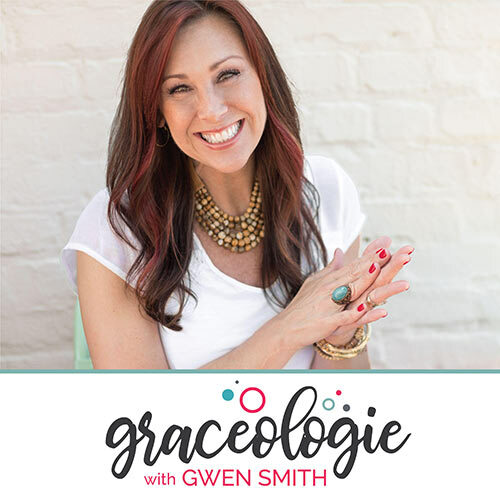 I had lost my job and was on the brink of financial when God amazingly led me through my unbelieving husband’s prompting to solicit a company that wasn’t even advertising any job openings. I had been unemployed for almost 5 months, my unemployment was only one week away from being used up, and I had been praying like crazy, along with the elders of my church and many others, that God would provide for our needs according to his Sovereign Will. So now I was just standing still and waiting to see what God was going to do! I kept thinking about how David strengthened himself in the Lord when he faced many fears and challenges, and so I kept on reading God’s word and praying and trusting and throwing myself at the feet of Jesus and surrendering my life completely to Him, knowing that I was powerless and needed to completely trust my Lord and Savior for my life and circumstances! God strengthened me and humbled me during this dark time of unemployment and helped me to draw near and rely solely on Him for grace and help in time of need! And he answered my prayer for employment in an amazing way–the company that I solicited contacted me for an interview, and I started working for them one week later! I found out from a fellow employee that the very day my resume was received was the day they had made a decision to open the position God had in mind for me! They didn’t even think about advertising the position because God had ordained that my solicitation for employment would arrive at exactly the right moment and He worked in their hearts to hire me for the job! It has been three months now since I started working, and I am still awed by God’s amazing grace, mercy and faithfulness, and I give Him all praise, honor and glory!! I have seen the joy of my Lord as my strength in my own life. Over the past four months, my husband has been diagnosed with (and successfully treated for!) tongue cancer, my mom became very ill and passed away from a tumor in her lung, and my husband underwent a second surgery to remove a carotid body tumor (benign!) from the other side of his neck. My only source of survival through all of this was, in fact, the joy of my Lord. There were certainly times I did not feel joyful, but I did have that strength to draw upon. That strength overflowed onto others and became a witness to just how awesome our God is. It wasn’t me though it was “Christ in [me] the hope of glory”, indeed glorious riches” (Colossians 1:17).